It’s a dinky little handset which will appear in various global markets has already been confirmed for the UK where it will retail for around £50-£60 (around $75-$90/AU$73-AU$88). 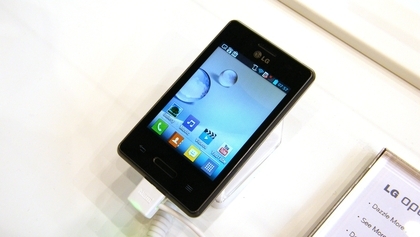 The Optimus L3 2 release date is pegged for the middle of the second quarter of this year, so we’d expect it to start hitting stores towards the end of April/beginning of May. 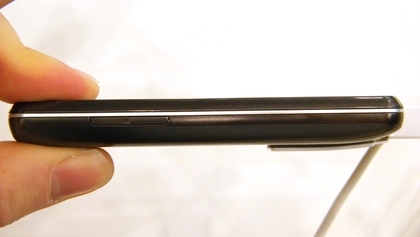 We were rather disappointed by the original Optimus L3 which launched at MWC last year, but LG has worked on the device to bring it up to speed. It still sports the same small compact design cantered round a 3.2-inch display, and the curved edges means it snugly sits in the hand. The chassis is noticeably plastic but we weren’t expecting brushed aluminium at this price point and the Optimus L3 II does feel sturdy enough. You do get the choice of three colours, black, white and silver, each of which have a slightly different finish on the rear of the L3 2, with the black sporting a glossy look, while white offers you a textured pattern. We preferred the white version as it provided more grip, but as the Optimus L3 2 is so small you can easily wrap your mitt around it and hold it tight. The ancient Android Gingerbread operating system has been replaced by the much newer Android Jelly Bean platform, with the Optimus L3 2 running version 4.1.2 out of the box. 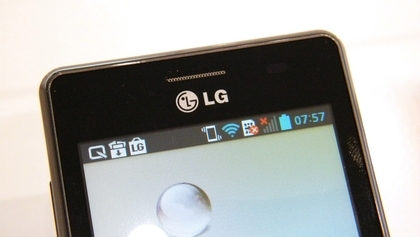 LG has added its IPS technology to the 3.2-inch display, but it’s very low res and there’s no getting away from the fact that you can clearly see the pixels on the 240 x 320 screen. A light overlay has been put on the Jelly Bean OS but it’s relatively inoffensive and adds handy features such as quick settings in the notifications drop down. The processor has been given a boost over the 800MHz chip found in the original, with the Optimus L3 II benefiting from a 1GHz single-core deal, which coupled with 512MB of RAM and Jelly Bean makes for a pretty good user experience for a low end device. 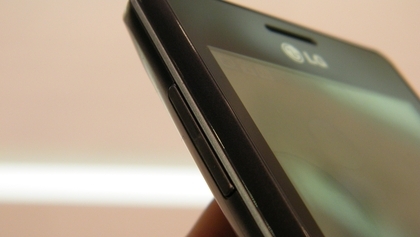 Where the original was chronically laggy, the Optimus L3 2 runs Jelly Bean efficiently and while it may not have the zip of more powerful devices, we didn’t find ourselves getting frustrated. 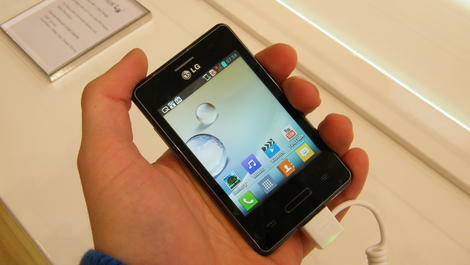 LG has popped its Quick Memo app onto the Optimus L3 2 which lets you to draw on top of whatever screen you’re currently viewing – allowing you to quickly jot down a phone number or draw a picture. 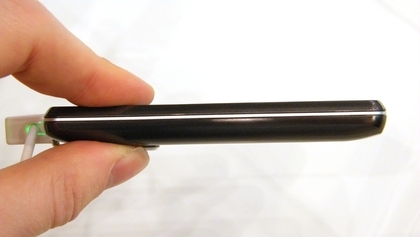 It’s a nice feature to have on an entry level device, but the small screen on the handset means drawing with your figure isn’t particularly easy, or accurate and we found ourselves generally making a bit of a mess. 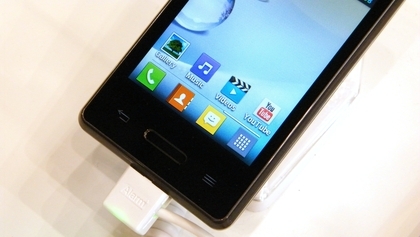 The physical home button below the screen is surrounded by an LED light which you can set to flash different colours for various notifications which ping up on your phone. This feature appears in the whole L-Series II range and it’s a handy one to have, as a glance at the phone will tell you if you’ve got an email, text message or Facebook comment. 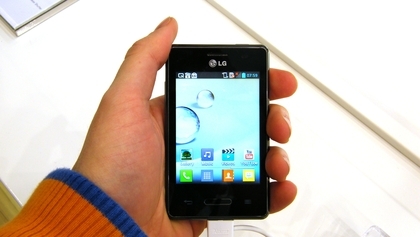 Thanks to the 102.6 x 61.1 x 11.9 mm body the home button plus back and menu touch keys either side of it are easy to hit without having to awkwardly shuffle the Optimus L3 2 in your hand. 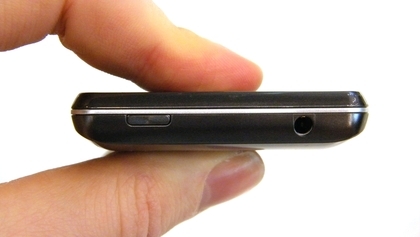 There’s only 4GB of internal storage in the Optimus L3 2, but the addition of a microSD slot means you don’t need to be economic with the media you put on the handset, but with its small low res screen you probably won’t be sticking movies on it. 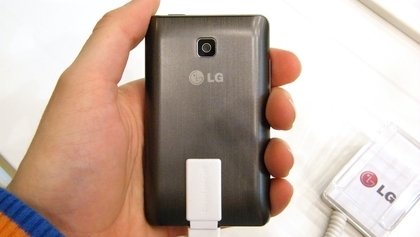 You get a 3MP round the back of the Optimus L3 II which is really the minimum we expect from smartphones these days. There isn’t a flash though so you’ll want to avoid snapping in low lighting, and there’s also no front facing camera so video calling is also out of the question. Image quality is, as you’d expect, pretty average with the low resolution display not helping the situation, but the camera is at least good enough for the odd picture here and there. 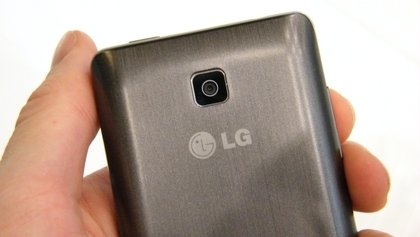 Shutter speed isn’t particularly quick, with the Optimus L3 2 taking a couple of seconds to go through the picture taking motions, but there is LG’s funky "Chesse Shutter" to hand which lets you take a picture by speaking to the handset. Say "Cheese", "Smile" or "Whiskey" for example and the Optimus L3 2 will happily snap a photo for you – particularly handy if you’re trying to take a picture of yourself. It worked surprisingly well on the noisy show floor. 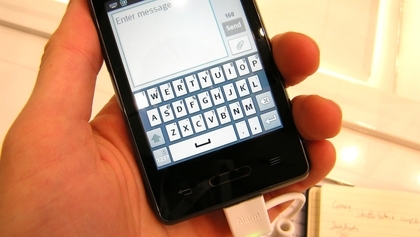 The keyboard on the LG Optimus L3 2 is a decent offering but is hampered by the size of the screen which means the keys are cramped and it’s difficult to tap out a sentence without making a mistake. Web browsing is also a slow affair as the single core processor struggles to load pages in a decent time, with desktop sites be a big effort for the Optimus L3 II. The handset does come with the stock Android browser and Chrome pre-installed which at least gives you a couple of pretty decent surfing options, just don’t expect to be flying around the world wide web. The LG Optimus L3 2 seems to be a well equipped smartphone for its bargain basement price and could well prove to be a popular choice for parents looking for a first handset for their little ones. Obviously the screen, processor and camera are hardly stellar features, but at this price point that can be forgiven as the L3 2 manages to offer up a solid user experience.